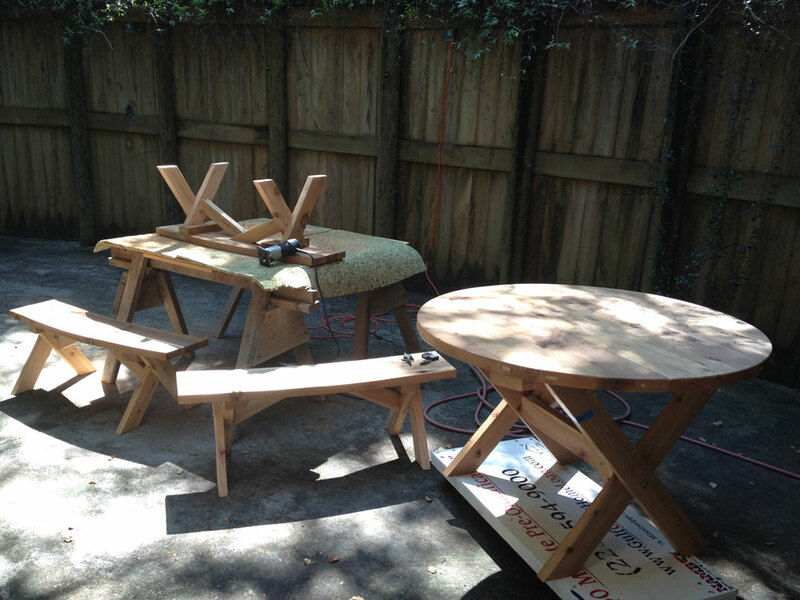 Festool figured substantially in the construction of this diminutive picnic table set for our youngest grandchildren. Kapex, Domino, Rotex and ETS Sanders with dust extractor. It’s worth spending money to get quality tools that make your job more beautiful, easier and/or faster. I timed it. I can change the power cord and hose from one sander to the other in 20 seconds. That makes it fast enough that I can work on a problem area and totally resolve it, then move on to another problem area, which is more efficient than coming back to each defect as a stage is finished. Cedar. It’s the wood I love to hate. I love the color, in all its variations. I love the smell. (Everyone loves the smell!) I love the durability of the heartwood, especially in projects intended for outdoor use. Then, there’s the down side. It’s soft, which makes it easy to mill. But, the softness makes it susceptible to scratches, dents and dings. Then, there are the knots. Which are most definitely not soft. And, around all those knots the confused grain tears out when the planer and jointer knives hit it. 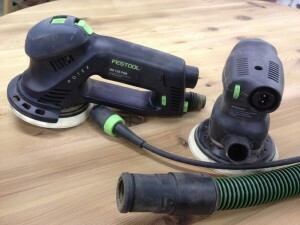 This is one of the places the Festool sanding system really shines. As you sand a project like this, some areas, like tearout, need some aggressive Rotex action to whip them into shape, followed by some time with the less aggressive Rotex random setting. The Rotex stroke length is longer than the ETS, so a quick switch to the same sandpaper grit on the ETS gives the fine, smooth finish sanding you want those grandbabies meals and behinds sitting on. I have a 5″ Rotex and a 5″ ETS and the system allows quick change from one sander to another without having two dust extractors.